Kern River Valley & the Sequoia National Forest have a long history of providing location filming sites and services. From arid Deserts to verdant Mountains, from remote Streams to formidable Rivers and Lakes, from deep Canyons to lush Meadows and Giant Sequoia Forests, and from winding Mountain Roads to dusty Hiking Trails, our diverse offerings are within an easy 3-4 hour drive from Hollywood. About the only locations we can't provide are metropolitan high-rise buildings and congested freeways. Ocean scenes are also a bit difficult to frame here, but sometimes when the wind comes up, Lake Isabella can look just like the Pacific. Hundreds of Major Motion Pictures, TV programs, Commercials and Music Videos have been filmed at numerous photogenic locations in our outdoor Mecca. When your project calls for the Great Outdoors or that small rural community look, we have just the location you need. Behind the scenes with Tim Allen's Home Improvement September 22nd, 1998 season opener, a Kern River rafting adventure with Tim's comedic touch. Filmed on location at Limestone campground on the upper "wild and scenic" Kern River, about 20 miles up river from Kernville. Limestone is one of our more popular location sites available to you. The Kern River Valley is a popular location site for those quaint rural scenes. Some of our area's historical buildings, ghost town, farms, ranches, cemeteries, general stores and the old flour mill in Weldon have seen film action before. Most sites can be traced to the stage and mule team era. Today, location crews look to us for desert vistas, remote wilderness areas, old gas stations, wild and scenic Kern River takes, and Lake Isabella backdrops. Homes, including rustic mountain cabins and palatial ranch estates may grace any frame. In addition, many commercials for expensive cars, motorcycles and trail bikes have been set on our quietly winding mountain roads. As you caravan up through the canyon to Kern River Valley you'll probably notice calm, tree shaded pools in the midst of roaring rapids. From this you may recall White Rock Soda and Kool commercial days. Kern River Valley's Film Location Library maintains volumes of location photos to help with your site selections. To meet your special requirements, we can provide a multitude of suggestions for areas most applicable to your project. Our locations are controlled by private individuals, Kern County Parks Department, USDA-Forest Service, Bureau of Land Management, California Fish & Game, the U.S. Corps of Engineers, and CalTrans. To partake of the myriad filming opportunities, you must often meet ownership or agency permit requirements. The K.R.V. Film Location Library office will assist you in identifying and submitting appropriate permit requests to the right people without delays or prolonged searches. A supply of the various forms is maintained at our facility and our staff is ready to help in any way possible. It's another reason we're popular with location crews. The Kern River Valley is one of the only Southern California areas that experiences all four seasons. Winter snowfalls; beautiful spring flora and fauna; colorful red, brown and yellow autumns; and sunny summer days. If you're interested in clear, star filled skies we have them, and there's no smog with which to contend. You can film at various elevations covering all the seasons in one trip during the early and late winter months. Our weather is great year round and seasonal averages are mostly moderate. The upper elevations, with lush green meadows and wilderness areas, are ideal for summer location shots. The comfortable climate and working conditions draw many cast and crew members along with their families back for rest and relaxation. Many have even purchased weekend retreat homes and property once they discover the serene beauty and smog free skies. 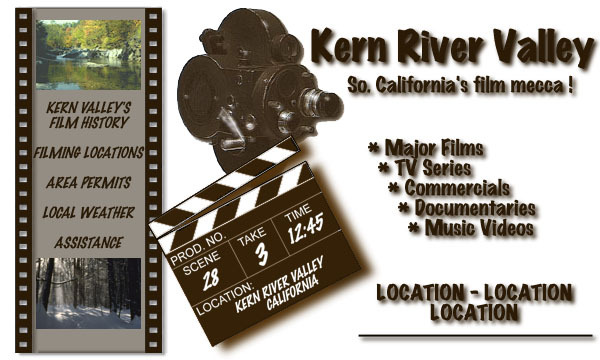 Every effort is made to ensure that your Kern River Valley film project is handled without a hitch. We can provide information or rental and reservation services for lodging, dining, or camping. Experienced, professional rafting, kayaking, rock climbing, hiking, and mountain biking guides and outfitters are ready to assist in any related production. We can help with local casting, as many SAG members and film support professionals live within our community. We can also coordinate local on-site medical personnel and emergency vehicle standbys, as well as liaison with appropriate law enforcement and site security matters. The Kern Valley Canyon Connection. Kern River Valley, California, USA. All rights reserved.